Water polo has long been a popular sport in Australia. 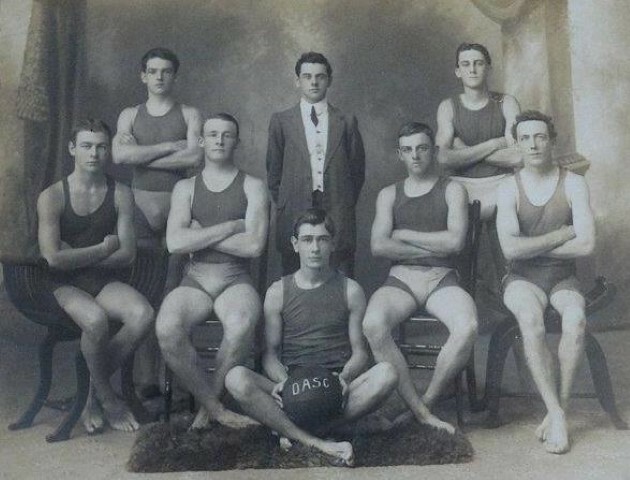 One of Drummoyne Water Polo Club‘s prized photographs is of the ‘Drummoyne Swimming Club, H. Christiansen’s Team, Winners of the ‘Club’ Water Polo Competition 1911-1912′. Bertie Theodore Erickson and George Peter Erickson both served in the First World War, along with their brothers Albert Victor Erickson and Roy Robert Erickson. While Bertie and George both survived the war, Albert and Roy were killed in action in France in August 1916. All four brothers are listed in the Drummoyne War Service Record. In August 1921 the Drummoyne Soldiers’ Sailors’ and Dependents’ Welfare Association presented the Drummoyne War Service Record to council. The book records the names of service men and women of the First World War from the Drummoyne area. The calligraphy and title page illustrations are by Drummoyne resident Henry John Allcock Baron while the full morocco binding is by Wal Taylor, a noted craftsman bookbinder of the period. 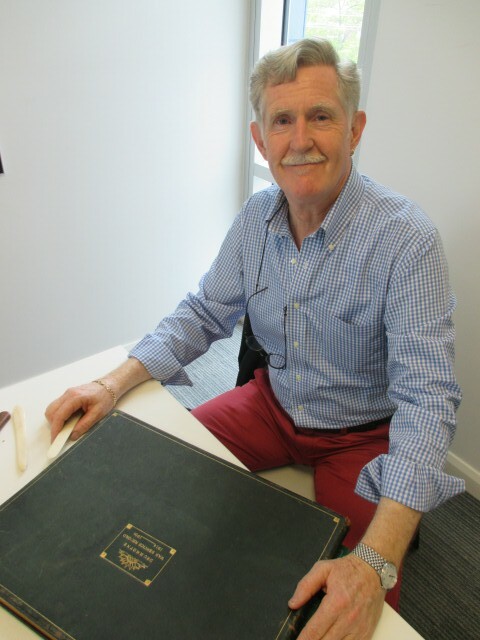 Over ninety years later the book is now being restored to its former condition by John Turner, a member of the NSW Guild of Craft Bookbinders. The original intention of the donors was that the book be held by council ‘for safe custody and exhibition in perpetuity’. John’s work will ensure that this wish is fulfilled. The Drummoyne War Service Record can be viewed on flickr. 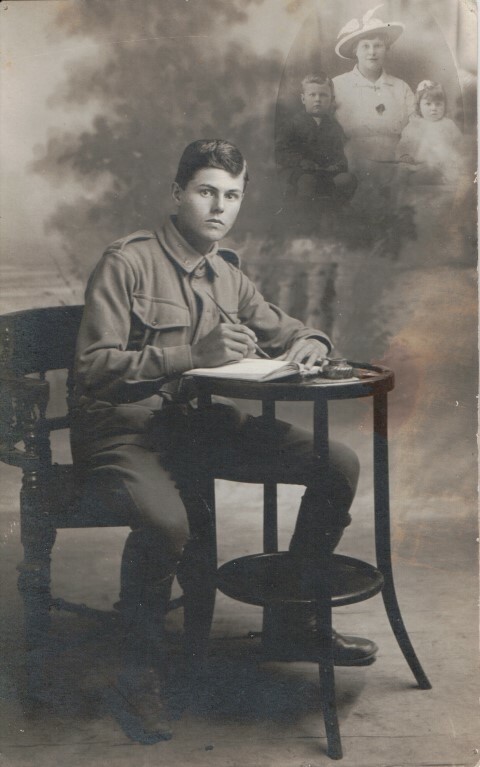 Local Studies has received a significant donation of First World War letters, postcards, photographs and memorabilia relating to Henry (Harry) Jeffery, his brother Robert (Bob) and their cousin Alfred (Alf) Cassidy. The letters and postcards were lovingly collected in an album by Harry and Bob‘s mother, Margaret. One hundred years later they provide a very special glimpse into the lives of the soldiers and the conditions they experienced. Harry was killed in action in Belgium on the 4 October 1917, aged 19 years while his cousin Alf was killed in action a few months earlier in France, aged 24 years. The generous donor Christine Tracy, a descendant of the brothers, felt it important that the album and photographs be preserved in Local Studies at Five Dock which is the suburb the boys called home. 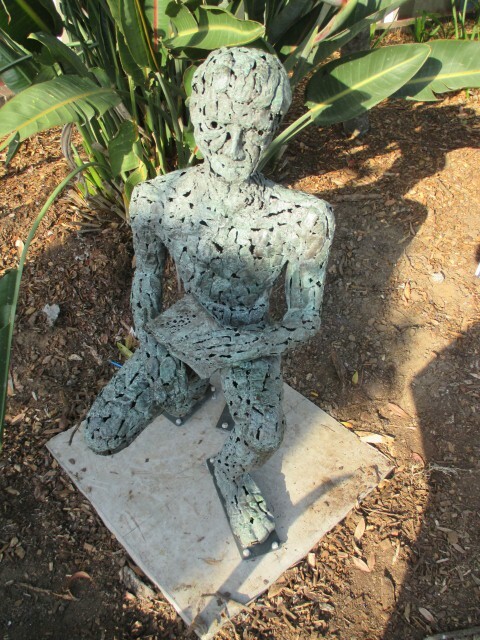 After ten years in storage, the sculpture The Reader by Bim Hilder is once more on public display. The sculpture was originally located adjacent to the entrance of the Five Dock Library (now Five Dock Post Office) on Great North Road. Following the relocation of Five Dock Library to its present site, the sculpture was put into storage for safekeeping. The Reader has been refurbished and positioned close to its original location, near Five Dock Post Office. It’s appropriate in the week that marks the 75th anniversary of the NSW Library Act, providing free library services to the people of NSW, that The Reader returns.